A small crash at the final corner blotted Dani Pedrosa's copy book on the opening day of the Jerez test but overall the Honda rider was pleased with his work. Having missed this year's race at Jerez through injury it's been 18 months since he had ridden at the circuit and he had to spend a lot of today dialling himself in and understanding the bike again. "Today was a little bit slower than normal," said Pedrosa. "It is almost two years that I have not come to this track. I start at the beginning and needed time because my memory was with Bridgestone and also I didn’t use this bike here. There were two different engines so I was comparing one bike to the other and the data. At the same time I was working on the setting because I had no setting from the race. It was a little bit difficult also because we need to wait a lot to get temperature on the track to start. Track time was quite short but we tried to do the best job today. I think today was more a set-up day. Now we can make better work to know the engine and tyres." 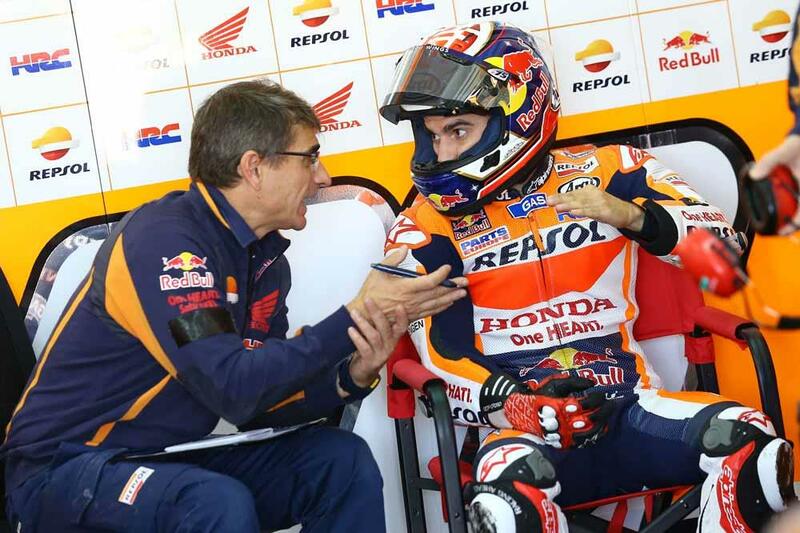 With the new engine to test Pedrosa said that it was hard to gain much insight into it until Honda had a better grasp of the electronics package and improved it significantly. "We need to work to make the electronics better. At the moment we’re playing with that to get the right feeling on the engine. Tonight, after some laps today, we will make some settings for tomorrow that we hope gives us clearer information to make a better comparison. The 2015 engine did all the year running so we know, power-wise, we know exactly what we’re running. "In the new engine we don't know this yet. We need to adjust many things and today was more about that than a clear comparison. Tomorrow maybe we can do a better comparison and we will have a more clear result than today. We didn't spend a lot of time on the electronics today because we tried to focus on the engine. We need to first fix the engine feeling. One and the other. Then we know we can go deeper into the extra help we have from the electronics." When asked how the new engine felt and whether it was smoother than the old one Pedrosa gave an insight into the goals of Honda to improve the engine but said that at the moment they need to spend more time evaluating it to see if it is an improvement. "The power line is a little bit different. We are trying to get more grip. Our bike is always shaking in the brakes. We’re trying to make this better. At this moment we’re still looking for a good way on the exit, not the entry. Today we did many laps for this. I think tonight the guys will work on this to have a better feeling tomorrow."